While it’s true iPhones have some of the best cameras on the market, your photos could probably use a little love after you’ve snapped them. With that in mind, we’re going through the best editing apps for iPhone available in 2019. Everything from one-tap fixes to getting in the weeds and adjusting every single slider available. Keep reading and discover some new apps that you’ll help your pictures look like they were taken by a professional or just help improve your selfie game. Let’s take a look at each of these apps, so you can pick the best photo editor for your iPhone — or even a few for your different needs. The long-time crowd favorite, VSCO, jam-packs its free version with filters, presets, and tools. That means you’ll be able to make drastic improvements to your photos without paying a dime. And if you do opt to upgrade to VSCO+, you’ll get access to their complete library of presets, which makes your editing options feel limitless. The majority of tools offered in VSCO, such as exposure, contrast, and temperature adjustments, are available in the free version. If you just want to sweeten up the colors in your photos and don’t need decorations like borders or text, the free version of VSCO should be enough. 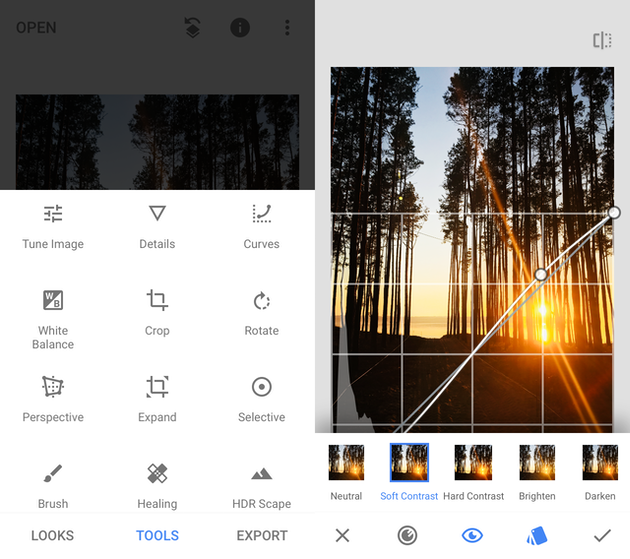 If you’ve ever used a Google app, you’ll feel right at home from the second you open Snapseed. Its clean and simple interface puts a handful of filters and a massive suite of tools at your fingertips. Tools like healing brush and selective color adjustments give you the power to edit your image exactly the way you want. And one of the best things about Snapseed is that everything the app can do is free and easy to access. There are no hidden settings or extra filters that need to be unlocked with a paid upgrade. 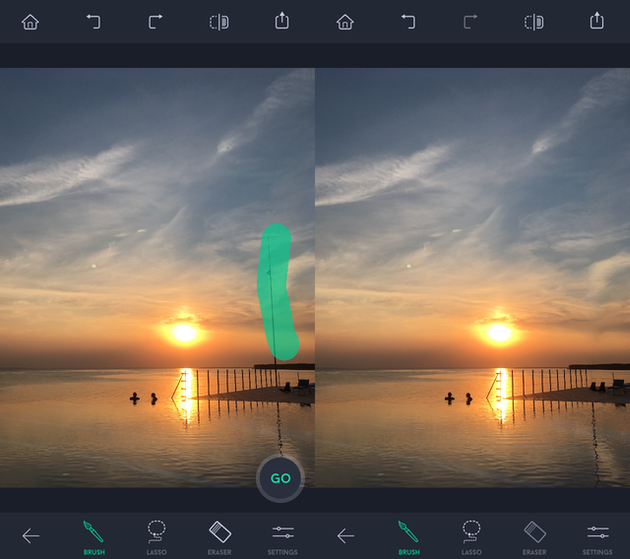 While you’re experimenting and searching for the best iOS photo editor, you’ll probably end up with multiple similar photos with slightly different edits. Try using an app like Gemini Photos to quickly find those redundant shots and clear unwanted ones. You can download and test it out it for free. Darkroom strikes the perfect balance between capability and ease of use. The free version of the app is cram-full of tools that help you make all the basic edits. Things like brightness and saturation adjustments are present right from the get-go, and the stripped-down interface helps put on emphasis on these major tools. Upgrading to the paid version will unlock a host of other presets. And the best part is, if you fall in love with a particular set of adjustments, you can save them as your own preset to reuse over and over again. The only app you’ll ever need to treat yo’ selfies. Living up to its name, FaceTune was designed to improve all kinds of portraits, allowing you to fix things like blemishes and face shapes. It’s easy to write off an app like FaceTune 2 — until you use it on a photo of yourself. We all take the occasional lousy selfie, but thanks to FaceTune 2 you can end up with a great-looking pic even if you’re having a bad hair day. 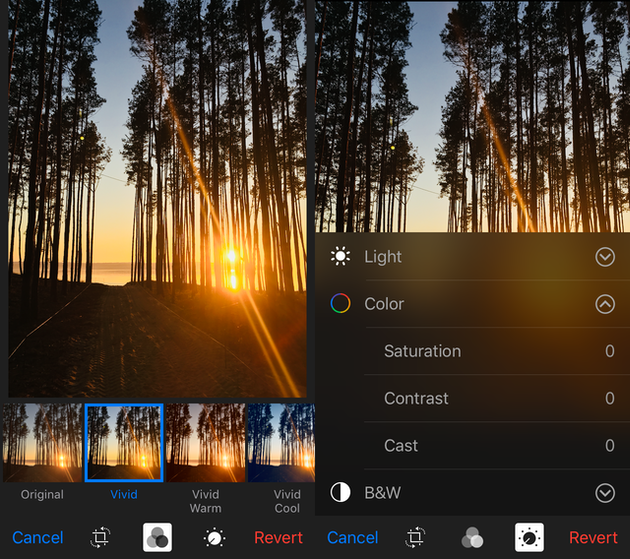 Similar to other apps on this list, Afterlight 2 is filled with filters and tools that will help step up your photography game. 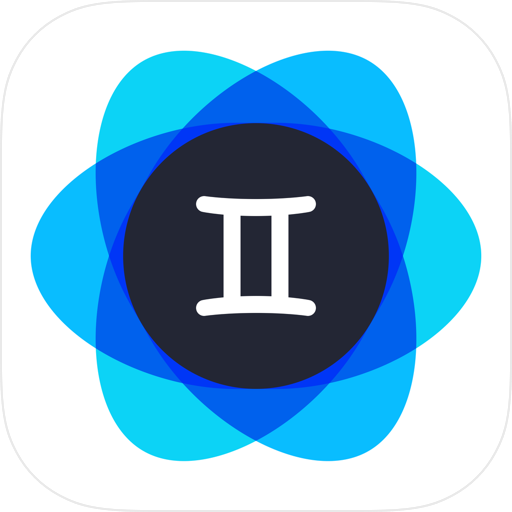 But the major differentiator in Afterlight 2 are the creative elements you’ll have access to. With things like the built-in layers functionality, you’ll be able to composite images on top of each other as well as add various design elements like texts and borders. We’ve all taken photos that don’t need much editing. You’re happy with the colors. You’re happy with the lighting. The only thing is there’s one unsightly power line in the corner of the frame. Enter TouchRetouch. 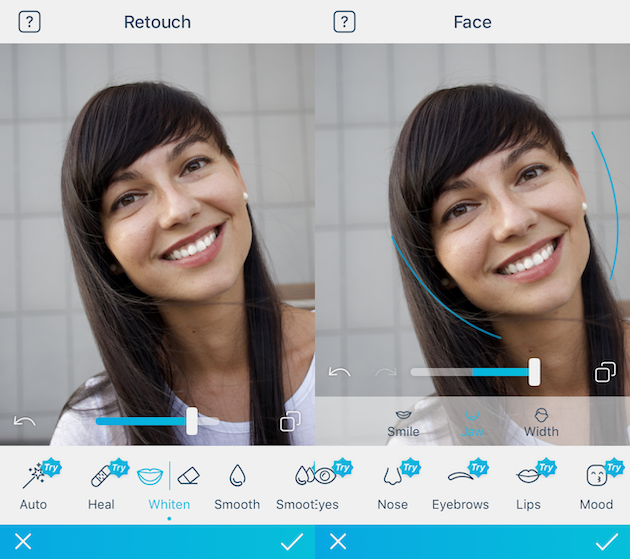 Much like FaceTune is able to clean up blemishes on your selfies, TouchRetouch is able to clean up the things cluttering up your landscapes. It lets you remove distracting objects with the tip of your finger, so you don’t have to discard an overall good photo because of one pesky detail. If you’ve ever edited photos in Adobe Lightroom on your desktop, this is the app for you. 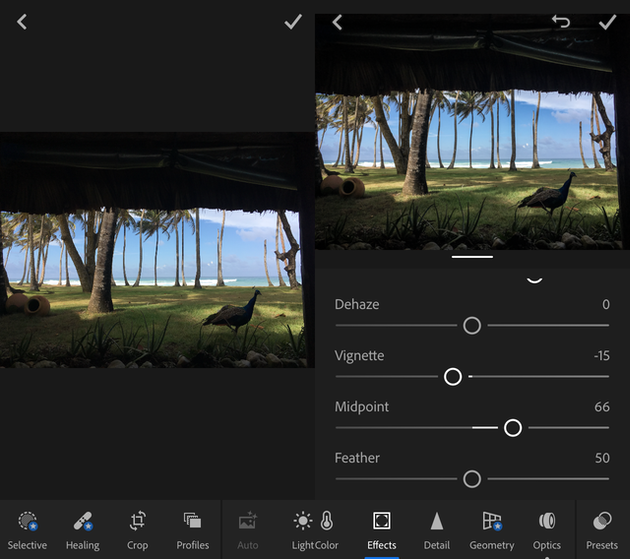 The iOS version of Lightroom brings all those familiar tools over to your mobile device. If Lightroom is already part of your photography workflow, there’s no reason to not have it on your iPhone. Moments after you capture a photo you can be editing it on your phone just like you would on your computer. Like many apps on this list, Lightroom offers a handful of features in the free version, but to unlock the rest, you’ll need to either upgrade or log in with your Adobe account. 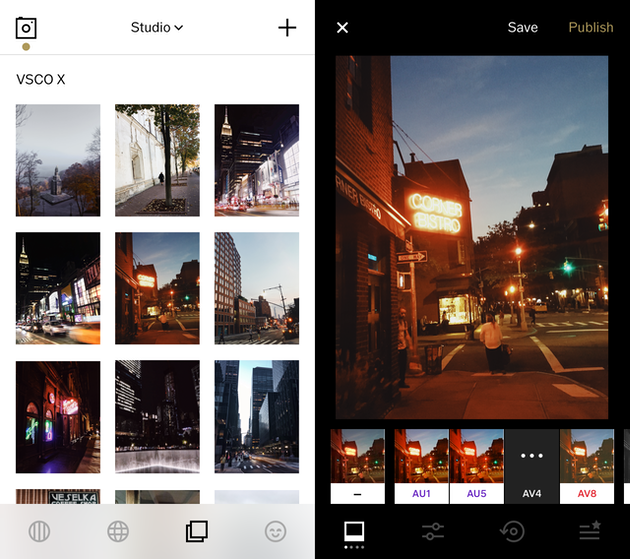 Adobe Photoshop Express is another editing powerhouse packed into a mobile app. Like Lightroom, it allows you to export directly to Lightroom or Photoshop on your desktop. That means you can start making adjustments on your phone and keep working on them later on your computer. It’s the power you’re used to from Adobe apps, but refreshed and 100% more mobile. No list that curates the best photo editing apps for iOS is complete without at least a mention of the native Photos app. 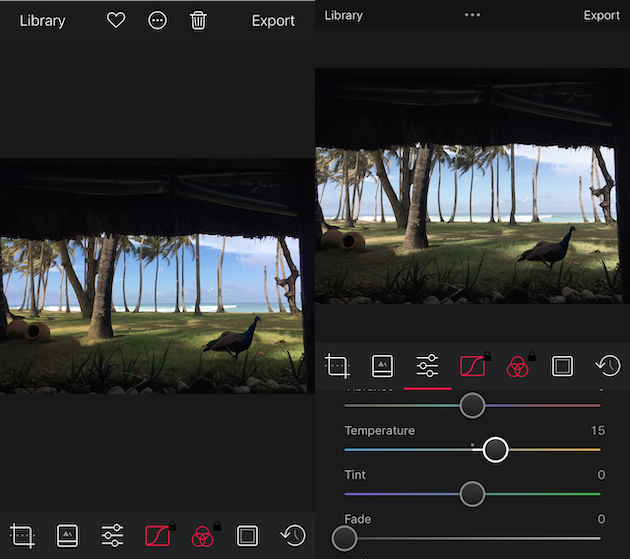 We’ve all come to expect features like cropping and rotating, but the level of control Apple gives you over color and lighting will surprise you. The tools available in Photos enable you to really fine-tune your pictures, from increasing contrast to changing color temperature. And the best part of it is the app comes shipped with your phone, integrated with your camera and completely free. So as soon as you take a photo, you can hit the Edit button and start making adjustments. Good luck on your quest for the best photo editor for iPhone, keep experimenting and find the apps that fit your workflow best! Most of these photo editors have a free version, so you can download and try them out before deciding to upgrade. So go ahead and try one or all of these apps out and let us know which ones are your favorites.